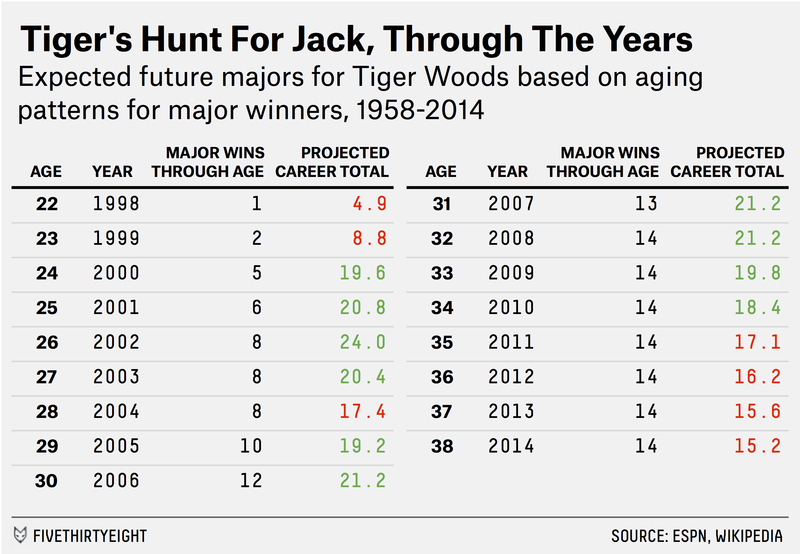 How Far Is Tiger Woods Behind Jack Nicklaus’s Major-Winning Pace? Tiger Woods is making his third appearance of the 2015 season at this year’s Masters. When Tiger Woods teed off Thursday afternoon to begin this year’s Masters bid, it was the start of just his third appearance of the 2015 season and his first competitive round since a back injury forced him to withdraw on the first day of the Farmers Insurance Open in early February. As Woods shot a 1-over-par 73 in the first round, all eyes were on his form — even though he’s done little of note over the past two seasons to warrant the attention. Famously, Woods has won 14 major golf championships over his stellar career, a tally that ranks second only to Jack Nicklaus’s 18 major titles. A win at the Masters would give Woods 15, but he hasn’t won a major since the 2008 U.S. Open. In the intervening years, his game and personal life have been thoroughly ravaged, with injuries taking a particular toll recently. What once seemed to be destiny — Woods’s overtaking of Nicklaus as the winningest major champion ever — now looks like a fool’s notion. If you toss out all major winners currently younger than 461 to prevent the sample from being skewed toward younger, still-active champions such as 25-year-old Rory McIlroy (whose future major totals are as yet unknown), the average major-winner in golf is about 32.5 years old. 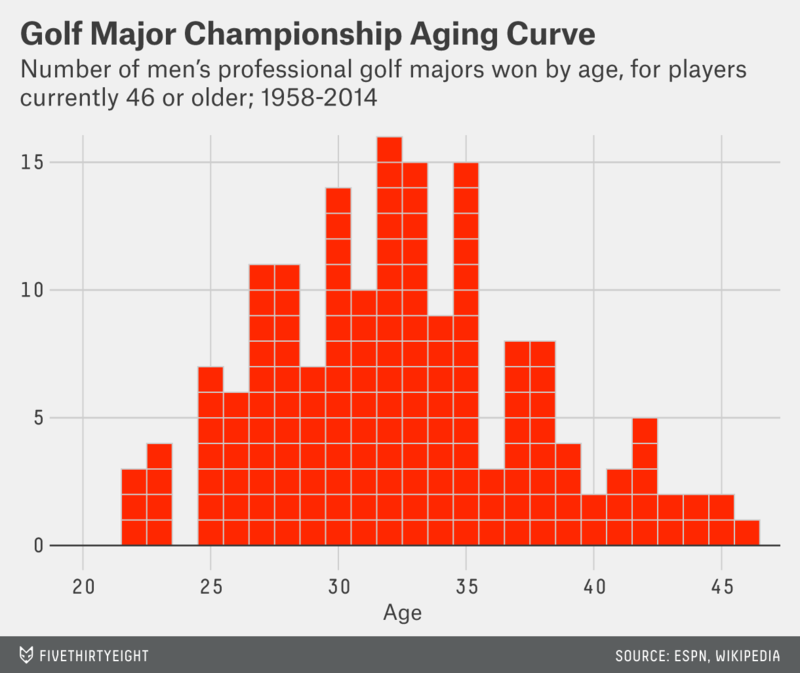 And only 12.5 percent of all major titles since 19582 were won by players aged 39 or older. By any measure, the time for winning majors is quickly running out for Woods. Since a major-less 2011, though, Woods’s projected career major tally dropped below the number necessary to pass Nicklaus. Our system now sets Woods’s expected remaining majors at a mere 1.2 — and that might be too high. The regression uses Woods’s entire track record to date, perhaps not realizing how much his form has slipped in recent seasons. It’s also worth noting that Nicklaus was an incredible outlier. He won more majors after the age of 37 (four) than all but 14 golfers have ever won in their entire careers. So at a certain point, it was probably unrealistic to have expected Woods to follow the same pace, even before witnessing how much his game — and health — have slipped in recent years. Woods front-loaded so many major titles that he’d only need a comparatively modest per-tournament win rate over the remainder of his career to pass Nicklaus. But even given that head start, Woods’s abrupt decline goes to show that there are no sure things in sports. The age at which Nicklaus won his final major. Excluding those of Julius Boros and Peter Thomson, who were left out of the aging-curve sample because they won major titles both before and after 1958. Specifically, we derived a multiplier for each age to estimate total lifetime majors based on the player’s career-to-date major count. As an example, the multiplier for an age-26 golfer is 3.0, meaning you should expect his career total of major wins to be 3.0 times what it was after his age-26 season. For Tiger Woods, who won eight major titles through age 26, this leads to a career major estimate of 24.